Unknown gunmen killed eight South Sudanese refugees, including women and children at Dima Refugee Camp in Gambella region of neighbouring Ethiopia over the weekend, a camp leader said. 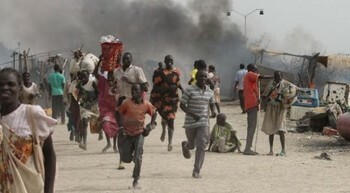 Andrew Kaka, chairman of Zone B at Dima camp, told Radio Tamazuj on Wednesday that at least eight people including women and children from the Murle tribe were killed and another person sustained injuries when three unidentified armed youth entered the camp around 7 pm and started shooting at the refugees on 24 December. Kaka further sad those who lost their lives include three women, four children and an elderly man aged 60. He pointed out that the eight refugees hailed from Boma state of South Sudan, adding they took refuge in Ethiopia after fighting erupted in South Sudan 2013.The camp leader said the wounded person is now receiving treatment at a healthcare centre in the camp. Kaka accused a group of local militia protecting gold mines in the region of attacking the refugees. The camp leader said that the Ethiopian government deployed security forces around the camp since Monday. He noted that the security situation returned to normal. “We are still waiting to know exactly who killed the innocent refugees,” he said. Ethiopian officials could not immediately be reached for commnent.